Have You Been Injured during Surgery in NJ? By its very nature, surgery is a potentially dangerous procedure with many inherent risks. The invasive manner in which surgery is performed makes it all the more essential for medical professionals to adhere to the established standard of care when preparing for, performing, and monitoring patients who undergo surgical procedures. Surgeons, their staff members, and the medical facilities that employ them have an obligation to take every necessary step in an effort to ensure the well-being of the patient. When errors are made during surgery or postoperative care, this negligence can result in a broad range of serious health complications and, in some instances, the death of the patient. If you or a loved one has suffered health complications due to a surgery-related error, you may have grounds to pursue compensation through a medical malpractice claim. At Fronzuto Law Group, our highly skilled team of medical malpractice attorneys is dedicated to advocating for victims of surgery errors and other forms of medical negligence across New Jersey. Having achieved millions of dollars in verdicts and settlements for clients who have suffered harm during a vast array of medical procedures, including childbirth, we are prepared to thoroughly investigate your claim, leveraging all of our knowledge and resources to achieve maximum compensation. To learn more about the legal avenues that may be available to you and find the answers to your pressing questions, please schedule a free initial consultation with our surgical error injury lawyers today by calling 973-435-4551 (toll free at 888-409-0816). You may also contact our law firm online. When you undergo surgery at a hospital, you place yourself in an incredibly vulnerable position and depend on the doctors, surgeons, and other medical personnel to be precise and accurate in all their actions. Medical negligence under these circumstances can have severe consequences. Surgical mistakes represent some of the most devastating types of medical malpractice because they often result in catastrophic injuries or even fatalities. This is true of even routine surgical procedures. Worse yet, serious surgical errors occur far more frequently than you might expect. Doctors and surgeons need to communicate effectively before, during, and after surgery. This is true whether the patient needs emergency surgery or has a scheduled surgical procedure planned well in advance. Failure to communicate important information about the patient, such as medical history, allergies, etc., can lead to mistakes in the operating room. Although the patient and their loved ones may be able to take steps to verify the exact procedure that is supposed to be performed, it is ultimately the responsibility of the medical professionals to safeguard the health of the patient. Surgical errors account for a large number of medical malpractice cases in New Jersey. Many mistakes during surgery constitute “surgical errors” because they were entirely preventable. Depending on the type of surgical error and the nature of the surgery, the victim of medical malpractice could be left with permanent damage to their brain, spinal cord, or limbs. Moreover, when the patient is in a weakened state after surgery, they be more susceptible to infection. That is why it is absolutely crucial for doctors and surgeons to take precautions before surgery and act responsibly and safely both during and after surgery. Failure to conduct a comprehensive patient history – This can include the patient’s medical history, past surgical procedures, and allergies. Failure to obtain informed consent – Doctors need to obtain informed consent from the patient or their family prior to surgery. Informed consent is required so that the patient understands the surgical procedure, all of their potential treatment options, and the potential risks. Wrong site surgery – Doctors are supposed to take measures before surgery to ensure that the surgeon performs the surgical procedure on the correct area of the body. Incorrect procedure – When charts are improperly marked prior to surgery, surgeons can potentially perform the wrong surgical procedure or operate on the wrong body part. This may expose the patient to unnecessary health risks and lasting damage. Operating on the wrong patient – Miscommunication by surgeons, doctors, nurses, and other medical staff can lead to mistakes in the operating room, including the surgeon performing a procedure on the wrong patient. Anesthesia errors – When the patient is allergic to certain medications or types of anesthesia, failure by medical personnel to check the patient’s history can lead to potentially deadly allergic reactions, heart attack, stroke, or death. 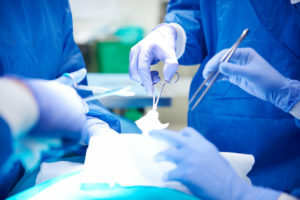 Lacerating organs or blood tissue – Negligence during surgery can lead to puncture wounds and other damage to internal organs, tissue, and nerves. Leaving foreign object in body after surgery – When surgeons do not exercise proper care during surgery, they may leave a surgical tool, instrument, sponge, or other foreign object inside the patient’s body. Post-surgical infection – Bacterial infection that lingers after surgery is a common concern, which is why hospital staff needs to monitor the patient and ensure that infection does not spread and that the patient does not go into septic shock. It is also important for surgeons to use sterilized equipment. Postoperative negligence – In addition to being at risk of infection after surgery, the patient may struggle to heal if the medical team does not follow up with the patient and make sure that everything is okay. For example, doctors and nurses must be able to recognize signs of internal bleeding so that the patient is not discharged prematurely. It is also important for hospital staff to properly monitor the patient’s health after surgery. Medication errors – A recent study conducted by researchers at a leading medical center found that roughly 50% of all surgeries involve a medication error. This may involve administering the wrong antibiotics after surgery or prescribing too much or too little medication to the patient. Depending on the patient’s reaction to the particular medication error, the results could be catastrophic. Negligent sanitation of surgical environment or surgical tools. Errors leading to the death of the patient. What Types of Surgical Errors Result in the Most Severe Injuries? Specific types of surgery can result in specific types of injuries and illnesses, including permanent disability for the patient. For instance, if a doctor makes a mistake during a C-section, it may result in cerebral palsy or another birth injury. Another type of surgery error that can have devastating consequences occurs when a surgeon acts negligently is plastic surgery. Even when a cosmetic surgery error does not result in catastrophic physical harm, the error can leave the patient with permanent scarring or some other physical deformity. Depending on the type of surgery and the nature of the medical error, the victim may suffer permanent disability, traumatic brain damage, spinal cord damage, unnecessary loss of a body part or organ, and severe pain and suffering. Going forward, the victim could be facing a lifetime of health issues that require additional surgeries, physical therapy and rehabilitation, and significant health care costs. In order to ensure that your interests are thoroughly protected, speak with one of our highly knowledgeable New Jersey medical malpractice attorneys for an honest assessment of your surgical error claim and a clear explanation of your legal options. Our New Jersey surgical error attorneys have successfully represented victims in a wide variety of surgical error claims. By conducting exhaustive investigations and consulting with leading experts in relevant fields, we formulate and present a compelling argument to support your claim for damages. Contact us today to schedule a free initial consultation about your surgical error claim: 973-435-4551 (toll free at 888-409-0816).